The Mestenhauser Legacy Fund supports the University of MInnesota's efforts to broaden international understanding through innovative programs and scholarship. 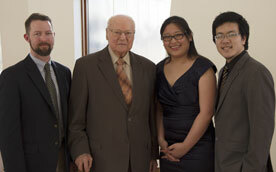 The fund is named in honor of professor emeritus Josef Mestenhauser, whose knowledge, dedication, and tireless energy laid the groundwork for the University of Minnesota's outstanding reputation in the field of international education. The annual Mestenhauser Lecture Series and Student Award for Excellence in Campus Internationalization are two examples of activities supported by the fund. The Mestenhauser Lecture Series is part of the GPS Alliance's initiative to internationalize the curriculum and campus by providing international and intercultural experiences for all students, faculty, and staff. The Student Award for Excellence in Campus Internationalization honors Professor Mestenhauser's long career of advocacy for and commitment to students. Private support enables the GPS Alliance to continue developing programs and initiatives that benefit the entire University of Minnesota community. Through these endeavors, the GPS Alliance recognizes and honors Josef Mestenhauser's profound legacy of excellence and leadership in the field of international education. The University of Minnesota hosted a Remembrance of Josef Mestenhauser on October 3, 2015, where more than 200 people joined in remembering the life and legacy of Dr. Mestenhauser. Learn more and watch a recording of the memorial.